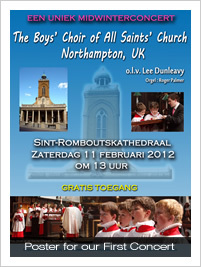 On Friday 10 February, twenty-four of our boy choristers will ‘set sail’ on their North European Tour. 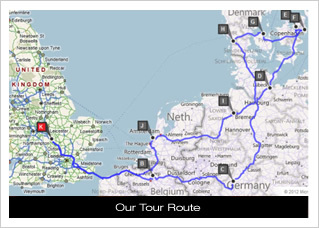 The majority of their week away is spent giving concerts in Denmark, but en route (and on the return journey) they will also be giving concerts and leading services in Belgium, Germany and The Netherlands. Their concert programme stretches from Bach, Handel and Purcell, through Britten, Elgar and Vaughan Williams, and into Bingham and our most recent commission from Michael Finnissy. On Saturday 11 February they give their first concert in St Rumbold’s Cathedral, Mechelen, Belgium, where they will perform a short work in Flemish by Flor Peeters, who was organist of the Cathedral for more than sixty years. That evening they travel on to Northampton’s twin-town of Marburg, where on the Sunday morning they will sing again at the great Elizabethkirche (they last sang there in 2007 for the 800th anniversary celebrations). As part of the Sunday morning service they will sing a short motet bilingually set by the Director of Music, Lee Dunleavy, in German and English. 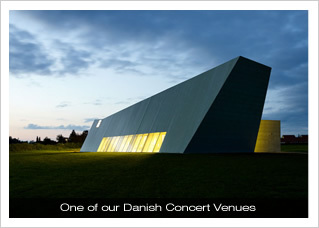 On Monday 13 February they travel into Denmark, and give their first concert at the Church of Holy Cross in Jyllinge. This remarkable building will host the choirs as they sing two world première performances; Humphrey Clucas and Adrian Self have written a total of four motets for the choir, set bilingually in English and Danish, and we are most grateful to them for their glorious music. Tuesday is a free day in Copenhagen, and with visits to the Little Mermaid, a Science Museum, and no Valentine’s to worry about (! ), there are sure to be great memories of this day. On Wednesday 15 and Thursday 16 February the Boys perform in Haderslev and Ribe Cathedrals, and visit a Viking Museum. 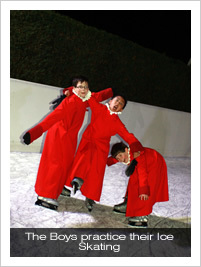 We are hoping to go ice skating on Thursday, too, and the Boys got in some good practice just before Christmas (pictured). On Friday 17 February we travel home, stopping for the day in the Netherlands where they will visit and sing at the European Space Research and Technology Centre (thank goodness we have Judith Bingham’s “Beneath these alien stars” in repertoire!) and at the Oude Kerk in Zoetermeer. First thing on Saturday morning we travel back home, full of remarkable stories about what will surely be a wonderful trip.